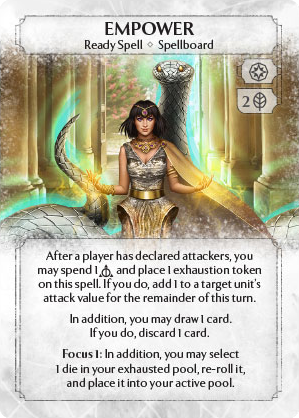 After a player has declared attackers, you may spend 1 [[basic]] and place 1 exhaustion token on this spell. If you do, add 1 to a target unit's attack value for the remainder of this turn. In addition, you may draw 1 card. If you do, discard 1 card. Focus 1: In addition, you may select 1 die in your exhausted pool, re-roll it, and place it into your active pool. The use case for this card is to be played when the battlefield is full and combat is not in your favor. The Idea is to be able to increase your power on Board and to spend your dice even if you can't summon more Units - similar to Attachments like frozen Crown but in ready spell form. This is also why the price is so high : it is meant to be played when the problem you have is not being able to spend your dice due to a full battlefield. This also legitimates why it has the card draw part : You are meant to be able to discard unusable cards for an advantage. With River Skald - activates the ability and grants an additional damage. With Unit Guard, as printed on Turtle Guard and Butterfly Monk, because it can threaten a kill on the counter even if all guards have just 1 attack.